Some, it must be said, were perfectly happy to spend another day cosseted in the luxury of the Sheraton hotel. In the end however, the matter was settled for us when word came through late in the evening that a deal had been struck and the border was working as usual - at a suitably glacial pace given its situation high in the mountains. At 7.31 am therefore the cars began rolling out of the carpark bang on schedule and set their sights on the way back to Argentina. Initially the day was an easy one which might have lulled some into a false sense of security but sitting on a three lane highway isn't what endurance rallying is all about and, so it was that after 111 km we turned off to begin the one regularity of the day at Cajon de los Valles. An 11.4 km jaunt might not sound much but this one was on very twisty, broken asphalt and gravel which was so steep in places that even the mountain goats took the chairlift. 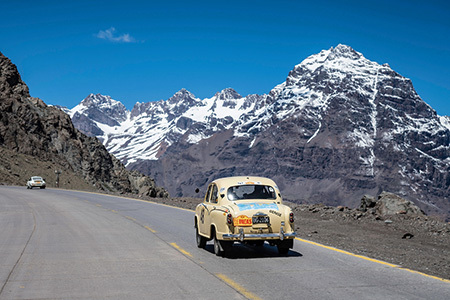 Cacti stood like sentinels at almost every hairpin and when we finally topped out at 1320 m the high Andes loomed large in the windscreen. Although we didn’t know it, this amazing little section was but a taste of things to come. This remote area is also well known for wildlife including the elusive puma, today we saw an Andean fox which approached some crews with evident curiosity. Ronald Vetters and Ann Puts newly ensconced in a 4x4 pick up truck fed it cookies while another crew reputedly offered it salami and a slice of ham. At the end of this section it was Chris 'master marshal' Elkins and Matt 'poacher turned gamekeeper' Bryson who were at the time control outside Villa Vicencio to welcome those intrepid crews who'd chosen this route.